This was not a bad number at all. In fact, using the classical electron radius ( m) for the “size” of the electron, if we blew up the electron to the size of the Earth (i.e. multiplying it by ), we are looking for asymmetries with millimeter precision! Strictly speaking, the 1989 electron EDM result at Amherst was not the first result in 20 years. In 1987, an experiment at the University of Washington obtained an upper limit on the mercury EDM, which turned out to imply an upper limit on various fundamental particles such as the electron, proton and neutron. But it only improved on the 1968 limit by a factor of 2, to . On the other hand, Larry Hunter’s Amherst experiment improved on the 1968 result by a factor of over 40. As a disclaimer of sorts, Larry Hunter was my research adviser and professor who first introduced me to precision measurement, research and even college-level physics in general (my first physics class at Amherst was taken under him). Although Amherst is an excellent liberal arts college, it does not have graduate students to power its research labs. College students stay on an experiment for at most one or two years, rarely acquiring truly in-depth expertise. Sometimes there were funds available to support a postdoc, but funding in general was also tight compared to a major university lab. Larry often described to me that his strategy was to find a niche which was not (yet) popular in the field, but still good science. Only then can you avoid being out-competed by labs at larger universities. And in this case the opportunity came for a new measurement of the electron EDM. This measurement was also done using cesium. But instead of using a beam, it was done in glass cells filled with cesium. By using a cell, one is able to examine a larger number of cesium atoms at once, directly boosting the statistics. (It’s also practically much easier and more compact compared to a beam, as you don’t have to setup a vacuum chamber.) But this only works if the collisions of the atoms with the glass walls of the cell don’t scramble the spin orientation of atoms (we call this the relaxation time), severely degrading the quality of the data. So the cells need to be carefully made, often with special wax lining in the interior to prevent this scrambling. My old test setup for my senior thesis at Amherst College. 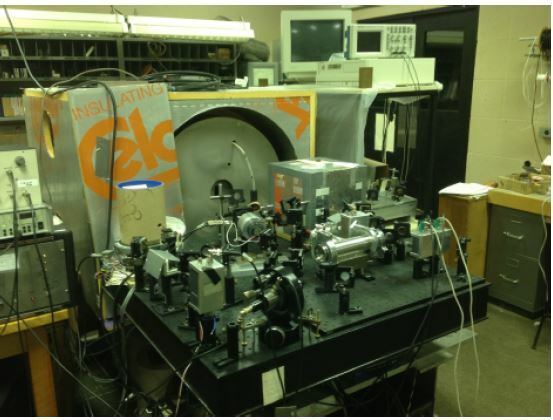 In the background are the cylindrical shields originally used to shield the Cs EDM experiment from the Earth’s and stray magnetic fields. The way the experiment works is similar to that of a Cs beam experiment which we have already encountered many times in this series. A cell filled with cesium atoms is immersed in an electric field. Lasers, tuned to an energy transition of Cs, are shone onto the cell to make the spins of the atoms all pointing along one axis ( ), while the electric field is pointing perpendicular to it ( ). If the electron EDM exists, it will cause the atoms to precess a little bit away from towards . When one reverses the direction of the electric field, the direction additional precession will be reversed. Thus by subtracting the two results, we can isolate the contribution of the electron EDM (there could be other things causing precession as well). A clever strategy to reduce noise is that the Hunter experiment used two cells instead of one, stacked on top of each other. Opposite electric fields were applied to the cells by holding the center electrode at a non-zero voltage and the two outer electrodes at ground (0 V). An assumption was made, that the two cells roughly experience the same stray magnetic fields, if there exist any (usually there are some residual fields from the Earth’s field, or various magnetic things around in the lab). A diagram of the arrangement of cesium cells in the Amherst experiment. It improved on the Washington bound by a factor of 21, or a factor of 42 on the 1968 Sandars bound. The experiment had several systematic limitations, the two major ones of which was that the electric field was not perfectly reversed (as I depicted in the above diagram), and stray current could leak between the top and bottom electrodes, causing the presence of a magnetic field that resulted in additional precession.